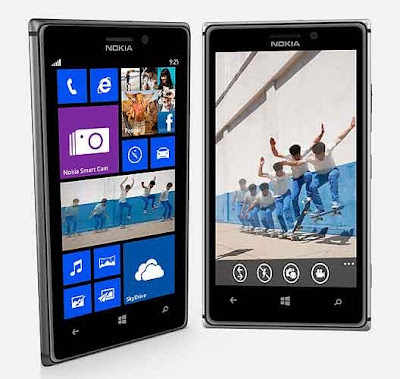 Nokia has launched the new Windows smartphone Lumia 925 today. The price for Nokia Lumia 925 is Rs 33,499 and it's already available in the market and online stores. The phone comes with Windows Phone 8 operating system and runs on 1.5GHz Snapdragon S4 Dual core processor. Nokia lumia 625 has a large display of 4.5 inches with resolution 768x1280 and in the battery type it has BL-4YW 2000mAh which gives you 440hrs standby time, up to 18.3hrs talk time on 2G and 12.8hrs on 3G Network. If you look at the camera features the phone has a 8.7 Megapixel Pure View primary camera with Dual Led flash, 4x digital zoom and Auto focus which gives you Full HD video recording 1080p @30fps and secondary camera resolution 720p HD 1280x720. It also has a 16GB Internal storage, 1GB RAM and Free cloud storage 7GB.